Discussions on travel, art, craft, and design with an appreciation for all kinds of other things. I was lost in Amsterdam on foot somewhere east of the Jordaan when I saw a shop with felt scarves and hats in the window, so I went in. The piece I liked best in the shop was a black jacket with a fitted waist and black wooden buttons by Anneke Copier. 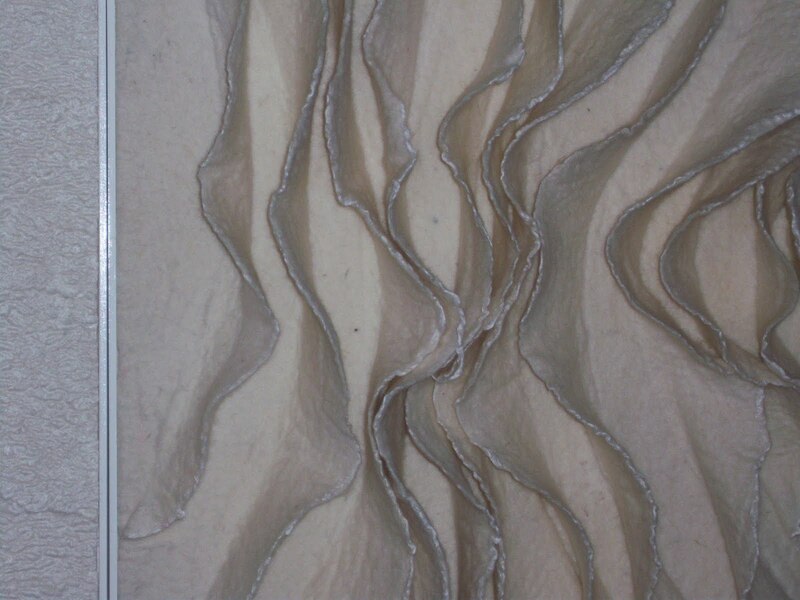 I contacted her and she told me about her “Felt for Architecture” created in collaboration with Italian interior designer Claudio Varone who lives in Amsterdam. Anneke told me I could see some of their work at an interior design shop called Wilhemena Winkle. With the help of my innkeeper (cottagekeeper), Astrid, I located the shop on the map on the street Veemkade, located on a long finger of land just south of North Amsterdam. I had a wonderfully long bike ride through the old city and out past the Centrale Bibliotheek, over a foot bridge and along the water until I finally found Wilhemina Winkle. The shop, housed in a moderately sized warehouse space, was partially divided by a wall half the height of the space. Roof tiles and samples for wood flooring had been stacked on the dusty floor, haphazardly against walls, and books of upholstery fabric populated the many tables and, curiously, a selection of teapots and matching cups for sale were on display on a glass shelf. Along the wall near the entrance on a long roughly hewn, wooden counter with stools sat a serve yourself espresso machine with mismatched coffee cups. I passed on making myself coffee but loved the spirit of the idea. Thinking the man working there would become free shortly so I could ask him about Copier’s work I gazed up at the lighting selection. Large resin encased fiber globes got my attention as they looked to be felted, but I think they might have been fiberglass. A man with a young, crying, daughter was apparently ahead of me to speak to the clerk, but the clerk was busy with a couple who were obviously in the market for home decoration—these things take time. The girl continued to cry without intervention, so I made myself busy by photographing Copier’s work. 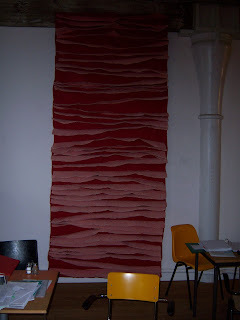 The first piece, closest to the coffee counter, was long and had been hung vertically like a banner. 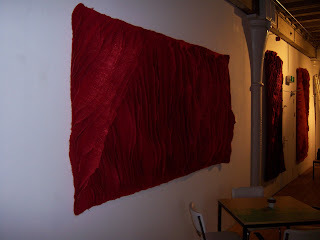 White silk panels covered in thin layers of red merino wool had been felted perpendicularly to the red felt matrix giving the piece three dimensions. 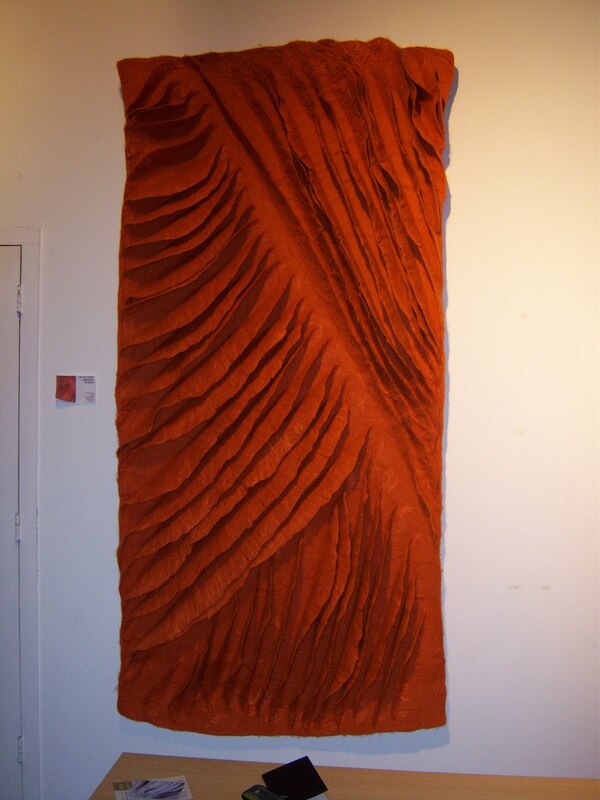 This was the only piece that incorporated silk and also the only piece in which all of the panels lay parallel to one another, like the rungs of a ladder. The rich texture of the wool in the other pieces was embellished with shiny flax fibers and made more complex by the directional relationships of the panels, which intersected each other at usually two or three different oblique angles per piece. Like most things made of felt, Copier’s pieces (designed by Claudio Verone) encourage touching and the panels can be toyed with and rearranged, which changes the overall appearance of a piece and gives the surfaces different shapes and shades of color, relationships of dark to light, as they are manipulated. The smallest is 90x80cm (the double white piece) and the largest is 230x116cm (the vertical red piece with silk). 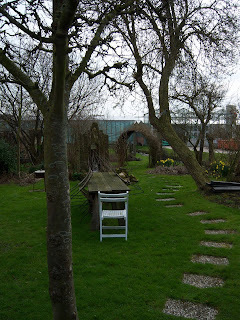 When I arrived back at the cottage where I was staying I was delighted to have received an email from Copier inviting me to visit her at her studio in a tiny village called Hauwert located about 45 minutes by train and bus outside of Amsterdam. 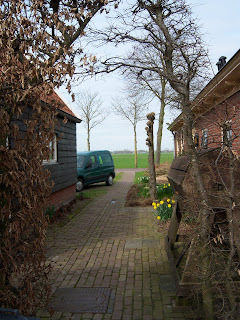 The next morning I was up early and took a train from Central Station to Hoorne, where I got on an eight seater bus and was the one of two riders to Hauwert. The driver was a tall older man with a long Dutch nose. He handed back my change from the fare with enormous hands as he seemed to hunch in order to fit inside the tiny van. He was one of the only Dutch people I met who didn’t speak English and I suspect the other person on his route was a friend going along for the ride because they talked casually the whole time. 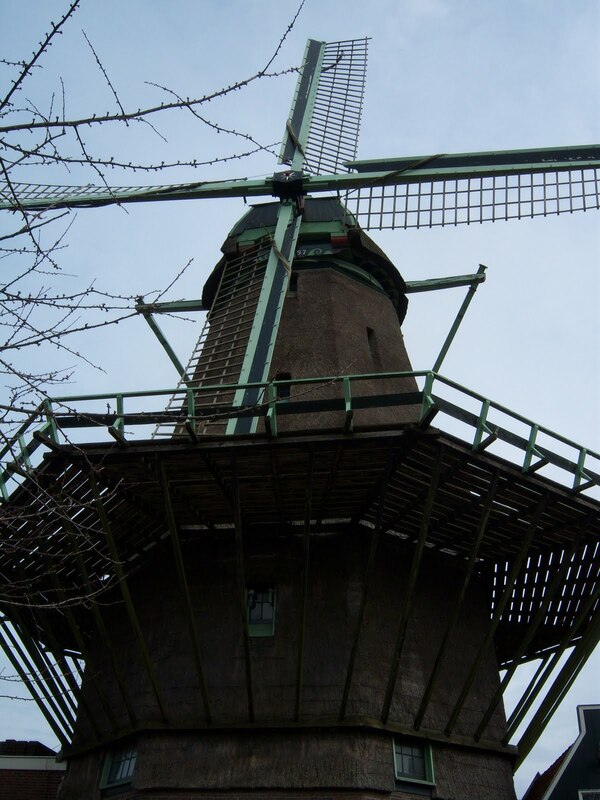 They only spoke to me one time with and interrogative intonation saying “Goldschmidt?”, “Goldschmidt?” I could only surmise they were discussing the American politician and I repeated “Goldschmidt?” The bus traveled along the very flat land where a few huge classically Dutch windmills hovered over the faraway landscape. Irrigation channels swollen with spring rain water had been carved through the bright green fields as well as dense wooded areas. Sheep dotted the verdant pastures where there weren’t rows of tired gray, uncleared crops. We drove through a small hamlet with a small brick bakery as the only sign of commercialism and then shortly after stopped at a house with a sign in front that read “Goldschmidt.” Anneke’s house was next door. As I walked up her drive she came out and greeted me with a smile and I thanked her, probably one too many times, for having me. Next to her tile roofed brick house was her workshop, which I found out had been recently built, but was nicely matched to the quaint, pastoral aesthetic of Anneke’s property with a brick foundation. 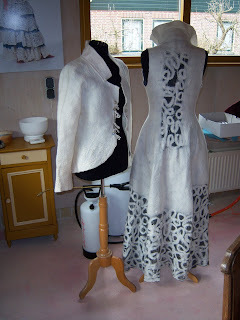 Inside her shop, the first felt pieces were a white felted jacket and a long white felt vest with a high collar and dark charcoal silk accents. She said she’d made them for a show she’d just returned from in France and that they were intended as clothing for a bride. The jacket has a deeper, creamier white appearance because of its thicker density and they both have been felted with shiny flax fibers giving them a familiar, silky luster. The long vest has a single ribbon front-closure and is decorated with looping patterns of wool felted through the loosely woven silk on the skirt and in a vertical pattern down the back. Anneke’s mother used to spin her own wool, “during the war,” she said, “they had to.” Anneke learned about wool and fiber arts from her mother who taught her to spin too. Though sheep dot the fields and farms of the Dutch countryside, Anneke said their wool is too course to use much for felt and that the sheep are mostly to keep the water ways from growing over with vegetation. She showed me two top hats she’d also made for the show in France, one with local wool, the other with merino from Australia. No question, the imported wool was much finer and softer. The appeal of the local wool was its more complex texture and the color variations in the dye in the course fibers. I took note of a yellow and green tea cozy with a circular pattern in it made from loose tufts. “A tea cozy, that’s what you call it?” she asked. “That’s what the British call them,” I said, “Americans don’t have much time for tea cozies.” She laughed and told me she drinks tea all day long. Anneke said the cozy was one of her early pieces. Until her recent venture into the tapestries with Verone, she’s mostly made clothing, and before that some things with her children. Copier was a school teacher before she switched over to being a full time felter. We discussed our children and discovered that we share the philosophy that children should be encouraged to explore and pursue the things they have a natural tendency towards. We talked a little bit about history, about the wars between the Spanish and the British and the Dutch, about the explorers who settled the western United States and we both agreed that seafaring and territory settlement seemed difficult and cold and that had we lived then we would have been less likely to enter that fray. 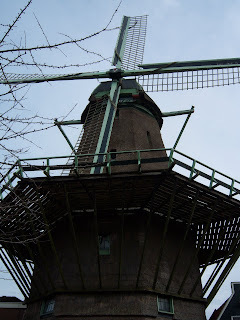 Her face lit and she raised her eyebrows when I mentioned how impressed I was with the windmills. “Would you like to go see a windmill?” she asked. 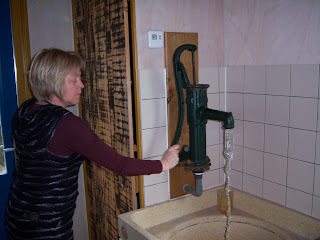 Of course I said I would love to, so after a brief tour of her property including introductions to two of three goats, we piled into her green Citroen van and zipped along to the nearest windmill where they produce the flour she uses for her bread. The granary was closed and I unfortunately didn’t experience the great churning sound of the mill at work, but I stood in the drive savoring the moment and trying to comprehend the monstrous scale of the industrious beast.